For two years, I navigated the fashion world in New York City full of glitzy celeb-studded events and impeccably dressed editors that helped me develop a sense of style appropriate for what my job entailed. Then I decided it was time for a change, and I moved to Washington, D.C., to work in politics. Nothing could have prepared me for the challenging task of switching professional fields and dress codes while trying to stay true to myself. Scroll down to find out how I tailored my personal style to a completely new work environment. I have never been one to shy away from a challenge. Over the last five years, I made my way through grad school and interned at some of the best fashion publications in the country before finally landing the job of my dreams at Elle.com. Surrounded by New York’s finest, I sat front row at New York Fashion Week, attending shows that counted Chrissy Teigen, John Legend, and Sofia Coppola among their guests. One of my most vivid memories is watching model Karen Elson, clad in a boho-inspired embroidered golden dress, walk down the Anna Sui runway amid flashing lights illuminating and immortalizing that perfect moment of divine beauty. Our sun-drenched offices in Hearst Tower in Midtown Manhattan had sweeping views of Central Park—an appropriate setting for fashion’s trend-makers, and elevator rides with supermodels, editors-in-chief, musicians, and actors were an everyday occurrence. Through it all, I watched and learned. I developed a love for all things “statement.” I wasn’t a mindless follower of trends or overly dramatic in my outfits, but I always tried to throw a dash of personality into my everyday attire. In January, I decided it was time for another challenge, and I moved to Washington, D.C., to work at one of the most influential political publications inside the Beltway. I relocated from one of New York’s most prestigious media companies to the Washington premises that forever marked the political history of this nation—the Watergate complex. Overlooking the Kennedy Center, my new office hosts some of America’s smartest political analysts and sharpest journalists. To put it bluntly, in a city where everyone and their Uber driver obsessively discusses immigration policies in mind-boggling detail, it’s easy to feel intimidated and out of place. 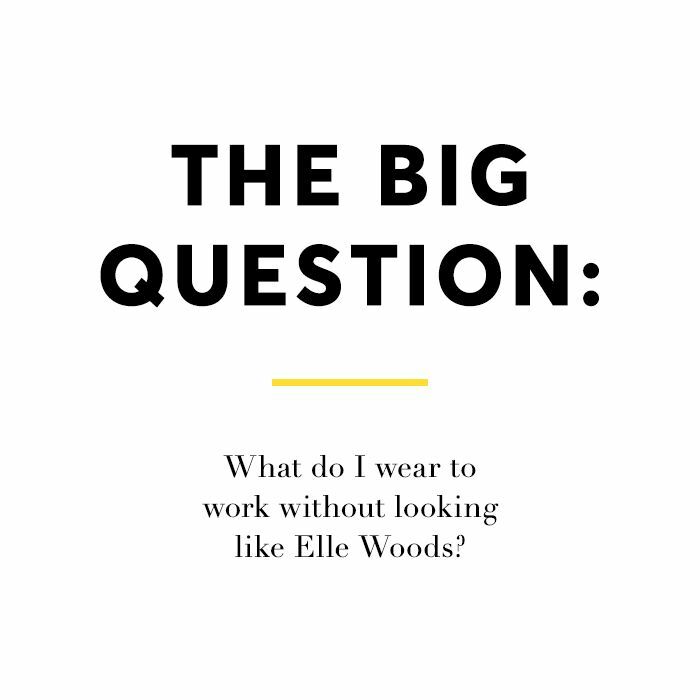 One nagging question was always in the back of my mind, even when I was digesting the latest news on presidential campaigns and Supreme Court cases: What do I wear to work without looking like Elle Woods? I binge-watched House of Cards, closely studying every element of Claire Underwood’s flawless power outfits. I sifted through local blogs searching for workwear fashion cues and clicked through every existing photo of Michelle Obama on Google. Unfortunately, I am no Robin Wright, and the last time I checked, Jason Wu and Naeem Khan were not waiting in line to dress me. All I had were suitcases full of New York-appropriate pieces, a sizable collection of “downtown chic” jeans, and skirts at least three inches shorter than what anyone in D.C. would consider appropriate. My favorite pair of black leather Free People pants with funky stitching on the sides wasn’t going to cut it. The challenge was to find middle ground—dressing appropriately and respectfully for my job and the people I work with while staying true to my self-deprecating, art-loving nature. Too many women lose their individuality by trying to blend in and look like someone else, be it a co-worker who’s acing the business-casual dress code or… Claire Underwood. I didn’t want that to be me, and besides, I could never naturally pull off a button-down oxford shirt, straight-leg pants, and kitten heels. I realized that when I took on the challenge of switching career fields, I also took on another, more personal one—reinventing my style without losing track of who I truly am. 1. Changing your style to fit a new career path doesn’t have to be stressful. Think of it as a creative project—finding new cool ways to present yourself. Have fun with it. 2. Think outside the box. Working in the same field for a long period of time can create the habit of always styling certain outfits the same way. Don’t be afraid to break out of your fashion routines. ​3. Look for inspiration, but don’t be a slave to trends. When it comes to your professional wardrobe, wear what you feel comfortable in, not what magazines deem trendy. Have you ever made a major career change? Or stopped working to care for children? How did your wardrobe transition after the change? Let us know in the comments below!